We have been raising egg laying hens for years. Most of our girls are old breeds of hens, who are good sized birds that lay nice sized, mostly large eggs. A couple of them lay eggs that are too big for the cartons we use, and a couple lay tiny little eggs. We keep those odd ones for us. In the spring, local schools hatch out baby chicks from eggs. And we end up with a few of those birds, the White Leghorns. They are bred to be thin birds that lay almost an egg every day. They are our adopted flocks. The rest of our birds we select as we order. 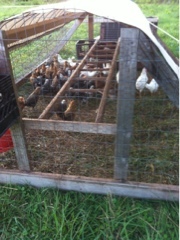 The most recent flock to join us as day old peepers is comprised of Arucanas and Barred Rocks. Last night, after dark, flock adjustments occurred. Some pens had lost members to predators, so they were combined: pulled from their roosts and moved to another, not quite as full pen. The young, not yet laying flock was moved from the brooder, and all 60 are in one pen together. If we combine or relocate the girls during daylight they fight with each other. If we wait until dark and put them together, they wake up, get fed, get moved and seem to do fine with each other. No fussing or fighting. The new 60 hens will begin laying eggs in November. It takes them 6-7 months before we start to see eggs, and the first few eggs each lays is tiny, too small for the cartons. And no poultry losses last night. The dogs are doing their jobs. 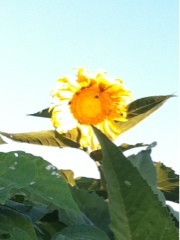 The sunflowers are blooming. The bees are all over them. 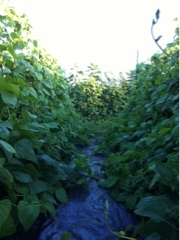 And the beans are 8 feet high!